Yesterday was Good Friday, and I had many good intentions for what I would accomplish. I wanted to surprise Michael with a few of his favorites—his mother’s hot cross buns with the secret ingredient (this would be my first attempt at making them) and some gourmet mac and cheese for dinner. He has begged me to make the buns for several years, but for a long time I didn’t have the family recipe. I finally got it from his mom last year, but we were traveling for Easter weekend so another year passed before I finally managed to attempt the family recipe. Michael had been at a conference all week in Hawaii, and although the weather and scenery were very beautiful, he was eager to get home and be done with traveling for a few weeks. He took the red eye out of Honolulu Thursday evening and headed home. So yesterday morning I started the hot cross buns around 10 am. Mixing would only take about 15 minutes, followed by a 90 minute rise, shaping, another 30 minute rise, baking around 20 minutes. I figured I would be done with the rolls by 1:30 at the latest, and then I could take a few photos and start on the mac and cheese. Michael’s flight was scheduled to land around 3:15 pm and everything would be ready by the time he got home. 5 pm. No buns in the oven. No mac and cheese. What happened to my day? Three little boys. They are so busy and into EVERYTHING. At least the baby hasn’t started crawling yet, so I only have two to chase around, for now, but he still wants Mommy’s constant attention and I cannot walk out of his radar. I am completely in awe of mothers who raise four or more children, especially when they are close in age like mine. This week was spring break, so everywhere you went there were mothers or fathers with all their kids at the grocery stores, the parks, walking in the neighborhood. I saw one mother at the grocery store who had three elementary school-aged children and one toddler in tow. We passed each other a couple times, and she laughed as she saw me struggling to keep my two older boys strapped in the cart and telling them to keep their hands to themselves. That’s when she stopped to tell me that she had six children, the first four were boys and the last two were girls. She had obviously survived this chaotic period when they are chock full of energy and everything seems like a game, so hopefully I will, too! Back to baking. So at 5 pm, after a day full of trying to keep the boys interested in activities that did not involve making ramps out of cardboard boxes to ride down the stairs like a slide—yes, they really did this yesterday while I was feeding the baby, and managed to break one of the banisters while doing it—I finally got to heat the oven and get the buns in. Unfortunately, they had risen so high that most of them crumpled when I brushed on the egg wash. They looked dismal as I popped them into the oven. Oh well, hopefully they would still taste ok, even if they didn’t look beautiful. Michael was very sweet and said that the buns looked wonderful. Very smart man! Hopefully I’ll have better luck making these next year. Now for the recipe. The family secret ingredient is mashed potatoes, which goes in with the flour. Real unseasoned mashed potatoes should be used, either fresh or leftover. Avoid instant mashed potatoes as the buns do not achieve the proper texture. 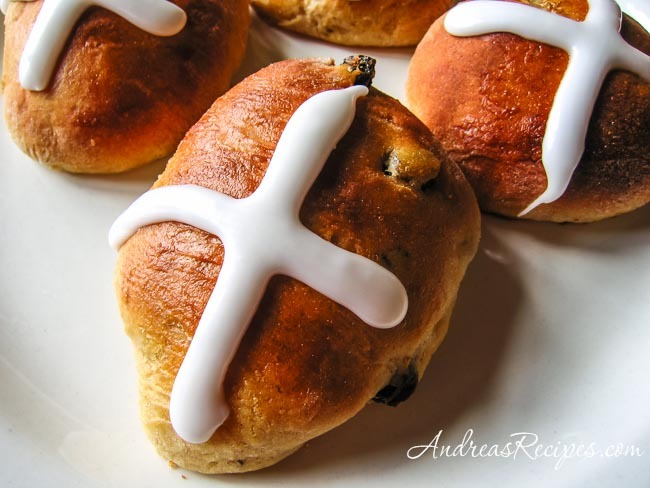 For other great hot cross buns recipes, check out Kalyn’s round-up on Blogher. Adapted from a recipe by Ann Meyers. In the bowl of the stand mixer, stir together the yeast, 2-1/4 cups of flour, salt, sugar, cinnamon, and nutmeg. Add the mashed potato and butter and cream the mixture together using the paddle attachment. Add the raisins, eggs, warm water, and milk. Continue mixing on low. Add the rest of the flour 1/4 cup at a time and mix well. Continue until the dough is easy to handle. Using the dough hook, knead the dough until smooth. Or you can turn the dough out onto a lightly floured board and knead until smooth. Put the dough into a greased bowl and cover with a towel. Allow to rise until doubled, about 1-1/2 hours. After dough is risen, punch it down and divide it into two equal pieces. Shape each piece into 16 round buns. Please buns on prepared baking sheets spaced 2 inches apart. Let rise until doubled, about 30 minutes. Stir together the egg yolk and cold water to make a glaze. Brush the buns with the glaze, and bake in preheated oven for 20 to 25 minutes, until golden brown on top. MAKE THE ICING: While the buns are baking, stir together the milk and confectioners sugar in a small bowl until you have a glaze with the consistency of frosting. It should not be runny, and you should be able to put it into a piping bag and squeeze it out. Remove buns from oven and put them on cooling racks. While buns are still warm, pipe a cross on top of each. Use active dry yeast: Add 2 packages active dry yeast to 1/2 cup warm water and stir to dissolve. Add with the milk and eggs, and continue as above. Make ahead tip: Make the buns the night before. Warm them and pipe the icing just before serving. Your hot cross buns are gorgeous. I’m in awe of how evenly you made the crosses. Just beautiful. Thanks for sharing and for linking to the others on Blogher too. Be proud, for sure!! My Mom’s recipe has mashed potatoes too … and she was always tucking leftover mashed potatoes into her every-day bread too. Kalyn and Alanna, thank you both for being so kind!